This picture is a bit weird to me because all the cast are looking at the viewer, even though the protagonist is in the picture. Apparently we (the viewer in the picture) are popular with everyone. Other than that, of course, I think it looks good. The protagonist is pointing at the viewer with a knowing glance, like "You. You're me. Got it?" I like the uniform designs. Seems distinguishing the bust area from the rest of the uniform is quite popular these days. Good thing. I've been anticipating this ever since I heard the news it was going to get an adaption, but that's mainly because I'll eat up almost any eroge anime adaption. It's definitely looking as though it could be a nice piece of work though. I wish it could be aired in Fall instead of summer though, I have weird OCD about anime being aired in a different season from the season it's set in. i curse my stupidness for not learning japanese when i was 16-17... then i could have played a truckload of Visual Novels.. but it is still not too late all i need is some time and perseverence. anyway the anime looks very promising i hope to see some romantic moments with all the characters, but i'm rooting for childhood friend because of the title. Go for your dreams, never give up.Because when you give up your dreams, you die! He has his moments and he doesn't look like a coward type character, he looks cool resolving those issues with everyone. I really like those kind of charismatic boys who stand up for something they think its right. probably because i wasn't like that in school. For me this would be one of them times where I say the MC should go for the twin tails lass cause I want Satsuki for myself! 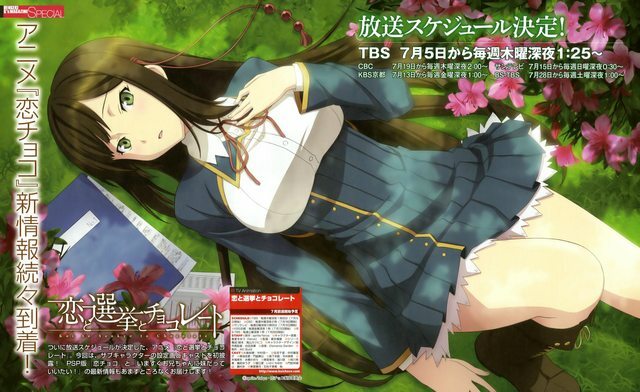 Totally love her character design, along with Yui from Muv-Luv summer is gonna be great! Do we have an airing date yet? Its says on that pic right there, July 5th. 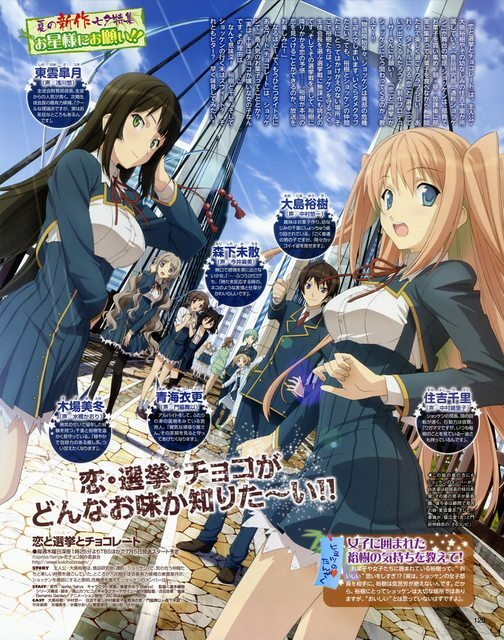 something interesting and an eroge adaptation. I will keep an eye for this and see if it will interest me but most of the vn adaptation interest me in the beginning but landslide in the middle and the end. This one has the best character designs I have seen thus far for the coming summer. I hope it does not turn into another accidentally funny moe-bore-fest. Takayama Katsuhiko (series composition) has done several adaptions that I liked, but diverged from little to a lot from the source material which made him very unpopular with fanboys. Meh, I wouldn't mind a funny moe-bore fest because the less drama there is the better for my health But, rest assured regardless of which route they decided to use all of them have drama in it . Fortunately the cast itself will be likeable so that can easily even out a "weak" story for me. @manga: Yup, it has been pretty fun although I was unsure about a scene if it appeared like that in the original source. Nontheless, the manga made me ready to - at least - watch the first few episodes in 1 month instead of waiting until it's over. Looking at the trailer for this I can't shake the feeling that the aesthetics aren't quite as appealing as those of the VN which are more water color based. That was part of the appeal for me coming into this so I guess that's a bit disappointing already. I don't trust AIC production values generally.